Shopping for pork can be confusing, especially when you're trying to figure out the difference between hams and cured pork shoulders. Though they come from different parts of the animal, they are sometimes sold under similar names. Not to worry. With a little information, you can sort things out and turn both cuts into delicious meals. One difference between ham and cured pork shoulder is where on the animal -- also known as the "cut" -- the meat comes from. True hams come from a pig's hind leg, whereas pork shoulders, as you might expect, are from high on the pig's front leg near the shoulder blade. Another difference between cured pork shoulder and ham is the preparation method. When manufacturers label a pork product as "cured," it means the product has been prepared with salt, either in the form of a dry rub, a savory or sweet brine, or by injection with a salt solution. 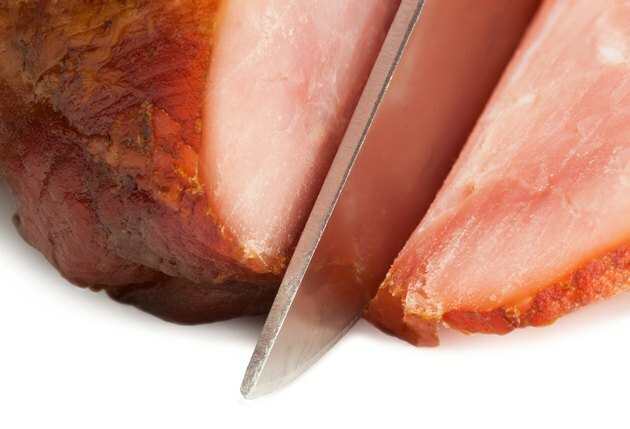 Hams, by contrast, can be sold with no additional processing, cured, or cured and smoked. Yet another difference between ham and cured shoulder is the names these cuts of meat are sold under. Cured pork shoulders are, reports Epicurious, sometimes labeled "picnic hams." Products labeled simply "ham" or "ham in natural juices" have not had any water added during processing, while hams that have had water added must be labeled as such. Whether you're working with ham or cured pork shoulder, a little knowledge helps you turn out great meals. Since pork tends to dry out, soak hams in a brine solution before cooking to help them retain moisture. The exception to this rule is cured hams; brining will make these too salty. Pork shoulders take well to slow-cooker recipes, while hams take well to roasting.